Media critics have for months blown the whistle on bias against Bernie Sanders. Progressive media watchdog FAIR has thoroughly documented how slanted the U.S. corporate media has been in favor of Wall Street-backed, corporate-friendly candidates like Hillary Clinton. Studies have even shown that Donald Trump gets 23 times as much coverage as Sanders, even though the Vermont senator is more popular among Americans. A case study in how this media bias works was exposed this week, in none other than the U.S. newspaper of record. 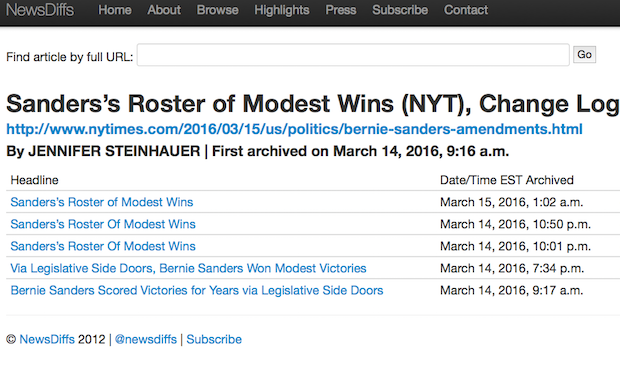 An anonymous user on the blogging website Medium revealed how the New York Times substantially edited an article about Sanders' long history of legislative victories, excising the more positive facts and comments. The Times — which has publicly endorsed Hillary Clinton — published an article by reporter Jennifer Steinhauer on Monday titled "Bernie Sanders Scored Victories for Years via Legislative Side Doors." Content in the article that shined positively on Sanders was removed as well. The Times cut out a quote from a longtime adviser who said Sanders' approach "has been a very successful strategy," and instead replaced it with two harshly critical paragraphs that suggest he would not be able to succeed at a national level and accuse him of promising voters " the moon and a good part of the sun." 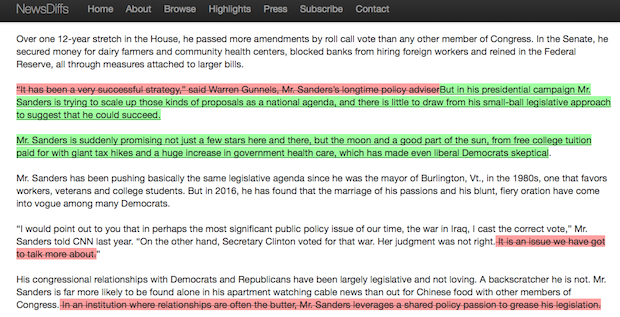 The newspaper also dropped a line noting how "Sanders leverages a shared policy passion to grease his legislation." A line describing Sanders' legislative approach as "the liberal mirror image of the Tea Party Republicans who oppose large-scale legislation" was also edited and taken out of context, reducing Sanders' record simply to "the liberal mirror image of the Tea Party Republicans." Moreover, the Times quietly added a phrase that implies Sanders only succeeds "at the margins," and added a qualifier that weakens a line that calls the Vermont senator an "effective, albeit modest, legislator." The Times makes no mention whatsoever of the edits in the piece, and has added no editor's notes. The newspaper's public editor, Margaret Sullivan, insisted she would report changes at the Times Public Editor's Journal. As of 2 pm EST on Wednesday, has not yet done so. Several prominent journalists, including Glenn Greenwald and Rolling Stone's Matt Taibbi, called the Times out on the quiet edits. New York Times Executive Editor Dean Baquet defended the edits in a statement to the Washington Post, insisting such changes are "actually pretty common." Although The Washington Post covered the controversy, it failed to mention in its report that The New York Times endorsed presidential candidate Hillary Clinton in January. Readers were assured that such an endorsement would not affect the publication's coverage, but articles like this certainly give pause for second thought.